Structure for best results: You need to have your website structured for the best results, for attracting the customers to your website. All the design features need to be easily understandable and consistent for having your visitors to navigate around your website without any trouble. Website content: The content needs to be displayed in a way which would offer useful information to the visitors without lacking information or getting the design overcrowded. Plan for the total number of pages for your website and determine the purpose for every page. Website Navigation: A lot of website users just require half a minute on a site before they have to decide whether they need to continue using it or switch to another one. This is where your site’s navigation plays a very important role. So never sacrifice the ease of your website’s use over fancy styles. In short, your responsive web design needs to be easy, attractive and informative for attracting users. 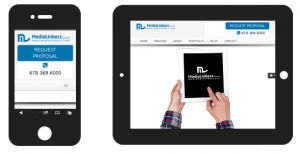 Medialinkers.info has a full team of creative web designers who would be happy to work on the responsive version of your website.